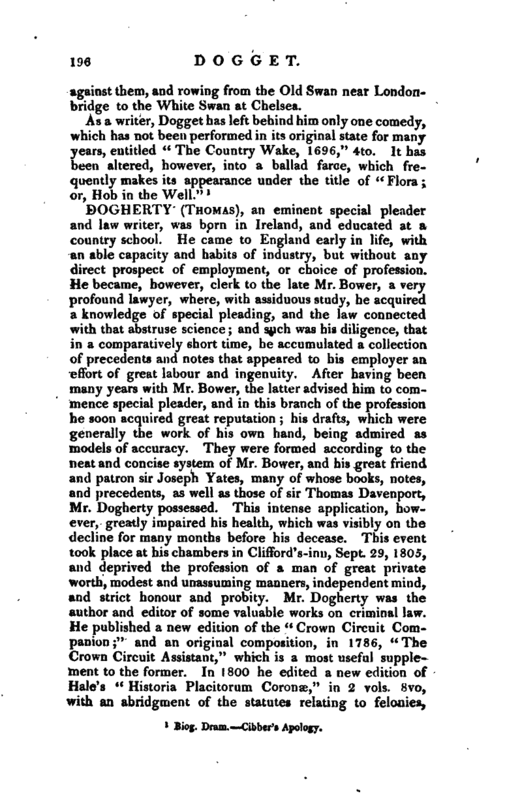 , an author and an actor, was born in Castle-street, Dublin, in the latter end of the seventeenth century, and made his first theatrical attempt on the stage of that metropolis but not meeting with encouragement suitable to his merit, he came over to England, and entered himself in a travelling company, but from thence very soon was removed to London, and established in Drury-lane and Lincoln’s-inn-fields theatres, where he | was universally liked in every character he performed, but in none more than those of Fondlewife in the “Old Bachelor,” and Ben in “Love for Love,” which Mr. Congreve, with whom he was a very great favourite, wrote in some measure with a view to his manner of acting. 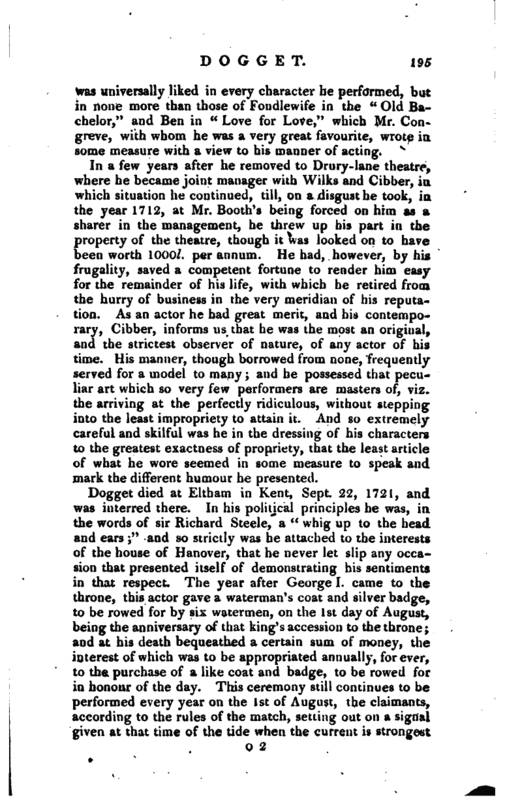 In a few years after he removed to Drury-lane theatre, where he became joint manager with Wilks and Gibber, in which situation he continued, till, on a disgust he took, in the year 1712, at Mr. Booth’s being forced on him as a sharer in the management, he threw up his part in the property of the theatre, though it was looked on to have been worth 1000l. per annum. 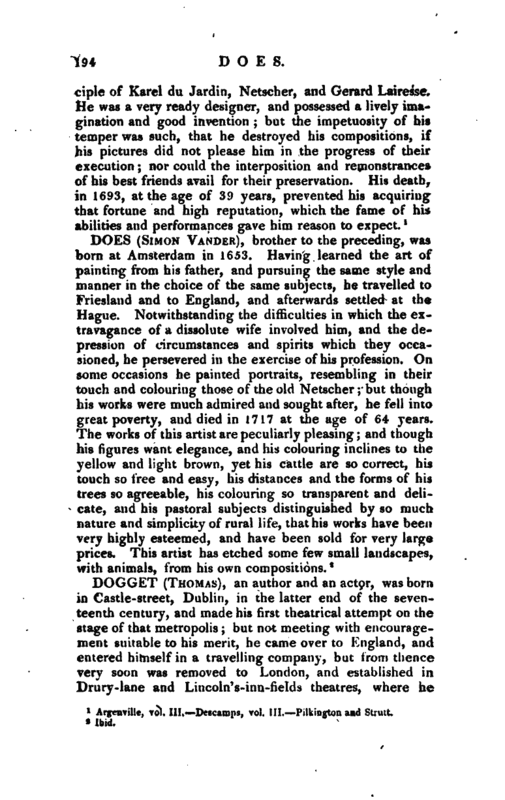 He had, however, by his frugality, saved a competent fortune to render him easy for the remainder of his life, with which he retired from the hurry of business in the very meridian of his reputation. As an actor he had great merit, and his contemporary, Gibber, informs us that he was the most an original, and the strictest observer of nature, of any actor of his time. His manner, though borrowed from none, frequently served for a model to many; and he possessed that peculiar art which so very few performers are masters of, viz. the arriving at the perfectly ridiculous, without stepping into the least impropriety to attain it. And so extremely careful and skilful was he in the dressing of his characters to the greatest exactness of propriety, that the least article of what he wore seemed in some measure to speak and mark the different humour he presented. Dogget died at Eltham in Kent, Sept. 22, 1721, and was interred there. In his political principles he was, in the words of sir Richard Steele, a “whig up to the head and ears;” and so strictly was he attached to the interests of the house of Hanover, that he never let slip any occasion that presented itself of demonstrating his sentiments in that respect. The year after George I. came to the throne, this actor gave a waterman’s coat and silver badge, to be rowed for by six watermen, on the 1st day of August, being the anniversary of that king’s accession to the throne; and at his death bequeathed a certain sum of money, the interest of which was to be appropriated annually, forever, to the purchase of a like coat and badge, to be rowed for in honour of the day. This ceremony still continues to be performed every year on the 1st of August, the claimants, according to the rules of the match, setting out on a signal given at that time of the tide when the current is strongest | against them, and rowing from the Old Swan near Londonbridge to the White Swan at Chelsea. 1 Biog. Dram. Cibber’s Apology.